Natures Natural Coconut with Vitamin E is an original recipe that promotes healthy hair and also acts as a moisturizer for dry scalp. 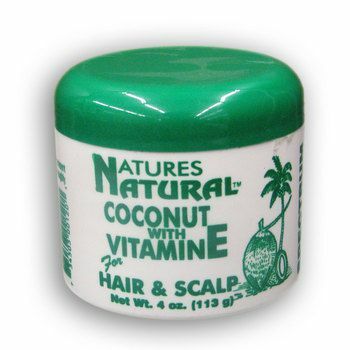 Coconut with Vitamin E works well on all natural waves, and relaxed hair styles such as braids, locks, relaxers and textures. It is a special moisturizing formula that softens, conditions and keep hair feeling good. Apply a reasonable amount to hair and scalp and massage thoroughly. Comb and style as usual. Coconut oil, mineral jelly, castor oil, soybean oil, vitamin E, fragrance.